The Burmese pythons, the subject of this care guide, is a giant snake with specific feeding, housing, and handling requirements, that is not ideal for most hobbyists and an unusual choice as a pet. Nonetheless, author Philippe de Vosjoli notes in the first chapter that his favorite snake was indeed a Burmese python, as no other snake “has ever equaled this particular animal in terms of personality and responsiveness.” Indeed, he says, the Burmese python’s docile nature has done much to help dispel scary myths and misconceptions about snakes in general. 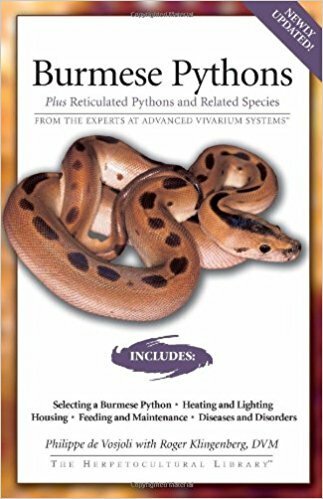 For snake hobbyists interested in purchasing and keeping this gentle giant, Burmese Pythons is an excellent introduction to the selection and purchase of a healthy snake offering no-nonsense advice about handling, housing, feeding, and breeding these snakes. The author’s chapter titled “How Accidents Happen” presents commonsense tips about handling Burmese pythons, discussing bites, the tail, and constriction, essential reading for all keepers, regardless of their experience level. Dr. Roger Klingenberg offers a chapter on diseases and disorders which proves useful and informative. A fully illustrated chapter dedicated to other large pythons offers information about size, longevity, morphs, maintenance, and breeding for the following giant snakes: the Indian python (a subspecies to the Asiatic rock python, like the Burmese python), the Sri Lankan python, the reticulated python, and the African rock python. Resources and index included.